When my now-husband (yippee!) got down on one knee, we were living in his childhood bedroom at his parents’ house, so the 20-odd grand some of our friends spent on their weddings was sounding a lot like a house deposit. Five years later and we’re Mr and Mrs, with our first wedding anniversary around the corner (when did that happen?! ), and we can look back on our wedding day with smiles on our faces and without red ink on our bank statements. Kate Middleton has been snapped out and about in Temperley, which means it’s literally fit for royalty. Spied on the FROW at past shows? Pixie Lott, Paloma Faith, Anna Kendrick, Jodie Kidd and Laura Bailey — all flaunting on-brand frocks. Join the fash-pack with this elegant, eye-poppingly detailed floor-sweeper, to hire from WishWantWear. 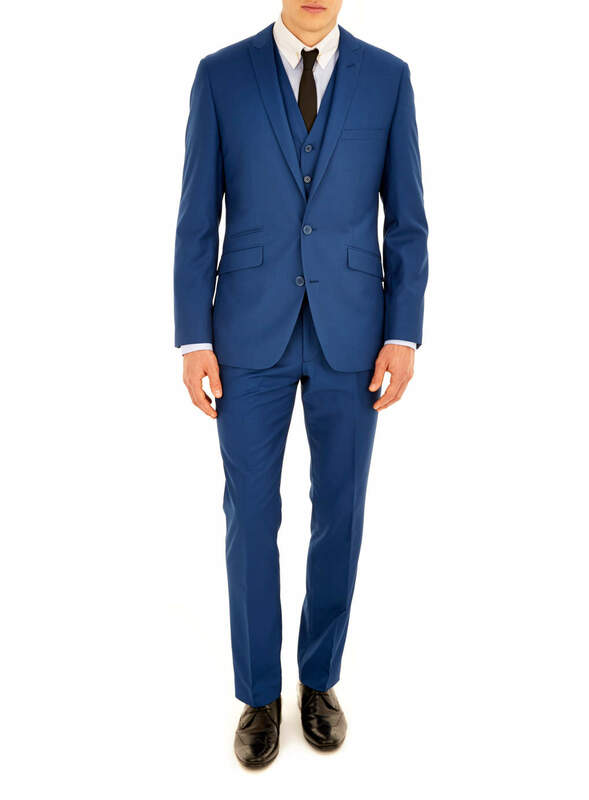 If he’s into anything on two wheels, this blue tonic slim-fit suit from none other than Italian scooter legends Lambretta will get him all revved up. It’s a three-piece — good news if he’s a waistcoat man — and even comes with the iconic scooter pin. 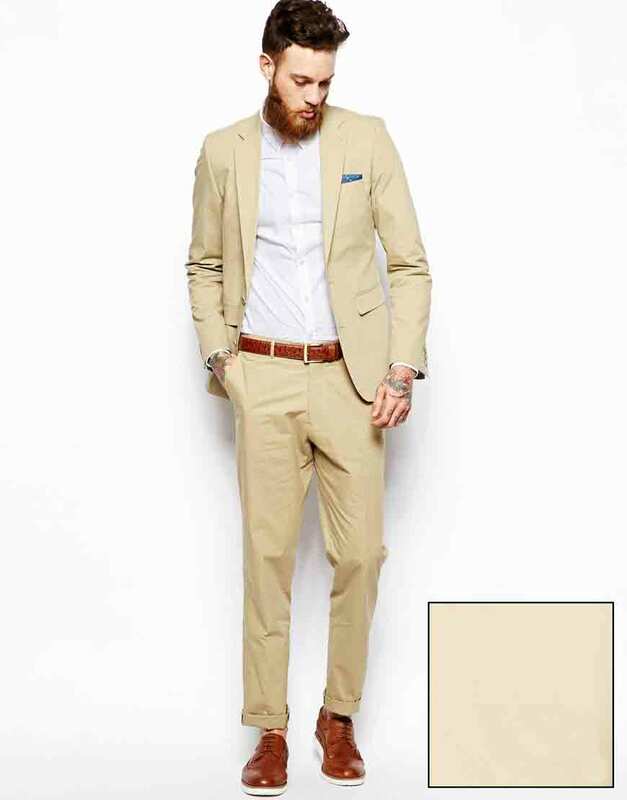 Just add a skinny tie, neutral shoes and his favourite crisp, white shirt. Kitty & Dulcie are my go-to girls for retro Fifties and Sixties-inspired looks, but their Cockney Rebel gown is something else: fun, frothy and fierce. Add a statement necklace, directional ’do and wow-factor heels and you’ve got yourself a head-to-toe rock ‘n’ roll entrance. Got a groom who wants to work his wild side just as much as you do? There’s nothing like a shock of an extraordinary shade to earn him his head-turning moment. 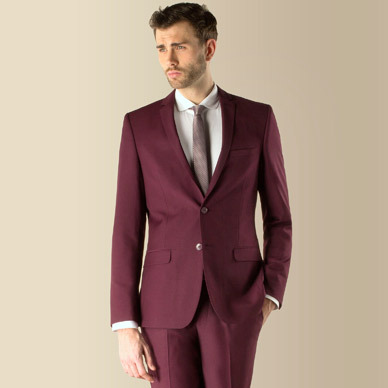 I’m all over this mulberry number from Red Herring at suit-staple Debenhams — just make sure his tie complements the colour and keep his shoes on the neutral, subtler side. Still living your life by WWCBD standards? (That’s What Would Carrie Bradshaw Do?) Then heads-up: Sarah Jessica Parker is just one of the big names on Badgley Mischka’s roster of fashionable fans. And you can add Taylor Swift, Kate Winslet, Catherine Zeta Jones and Jennifer Garner to that list. Slip into this shirred-skirted stunner with a savvy hire from WishWantWear — and with that sparkle-encrusted belt for glamour, trust me, next to no jewellery is necessary. Do the maths Worth £975, you can own your aisle in thisdesigner darling with four-day hire for £55. So he sighs at black and blue suits and waggles his hand at grey, but try and get him into anything bolder and he’s out immediately? This bronze beauty from Burton — yes, I went triple-alliteration, it’s worth it — with skinny fit and one-button jacket could be right up his different-but-not-too-scary street. Up the ante with quirkily-coloured accessories — if he dares. Psst… Secretly not harbouring Cinderella-style big-day tendencies? You mean you didn’t do the pillowcase-veil thing once during your childhood? Time to ’fess up, ’cause you’re not alone, and there are plenty of simply-chic looks like this one from début at Debenhams out there for the anti-ballgown set. Keep it subtle and sophisticated with that über-flattering empire line, and finish with chandelier earrings for some sleek grown-up sparkle. Behold: the LWD. (Little White Dress. But I know you know that already.) It’s summery. It’s girlie. And there’s serious accessory potential, whether it’s a Twenties/Thirties headpiece, a flower-child garland or a pop of red on shoes and corsages. What I love about this one is that the lush lace makes it feel super-special while the flirty cut leaves plenty of room for fun. And dancing. So much dancing. Do the maths £95. Full price. And that’s why budget brides go to BHS. Going for a fresh, sunny feel to your outdoor day? Swap intense black for chilled-out stone with this ASOS outfit. I’m a fan of what they’ve done with the brown belt and shoes, shirking the tie and adding an edgy, unexpected blue pocket square. But this one would work just as well with a skinny grey tie and black brogues if you want to bring the nonchalant-factor down a notch. 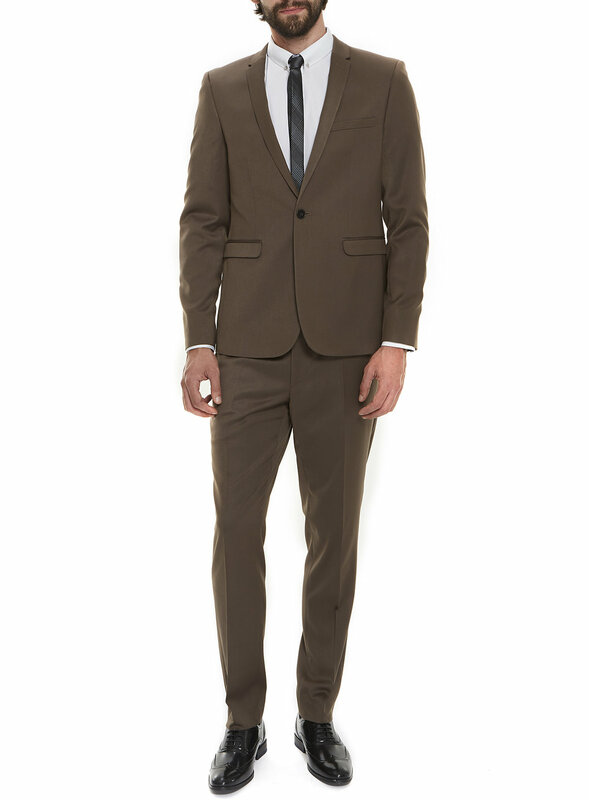 Do the maths £85 for this two-piece in poplin. Trust ASOS to make it awesome and affordable. Want more ways to save on your big day without skimping on style? The High-Street Bride’s Guide is out now on Amazon in paperback and on Kindle. 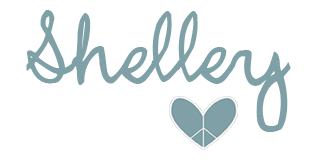 Huge thanks to Samantha, author of The High Street Bride's Guide and a true Pretty Thrifty hero! 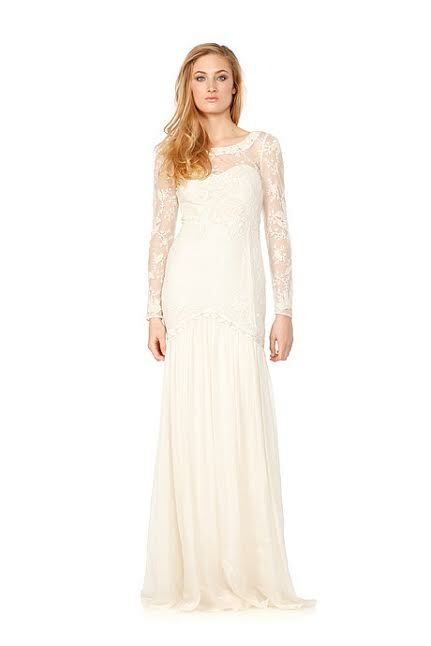 Will you be wearing high street for your wedding? I'd love to hear from you if you are!